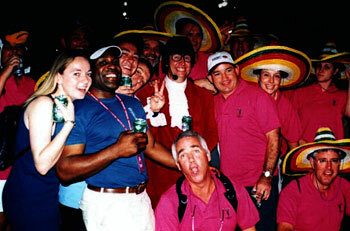 A summer evening 2002, probably sat in or outside a drinking establishment, and an invitation to participate in the Dubai Sevens later that year arises. How could I refuse? Invitation accepted, it suddenly dawned on me that I needed to find a team, as I couldnt play a match by myself. Whoops! Mid-September, and after struggling to find enough players to field a sevens side, the team is announced. Apprehensive at first, the team warmed to the idea (it must have been the 75 degrees that Dubai was offering) of being the first side to represent Harlequin Ladies in the competition. Details, squad and entry into the competition confirmed by November, we were only left with one task  to teach our squad to play sevens. Faced with the reality that our team only contained two real backs, and a lack of sevens experience, a coach was needed, and quickly! Venue and sevens specialist coach found, we set about training as well as we could. The team bonded well and it was soon obvious what positions people were going to be playing. Training continued, together with the après match training, for the remainder of the month. December 3rd arrives, and the tourists meet at Heathrow. The Gents in awe of just how much the Ladies can fit into their kitbags, and the Ladies in awe of just how little the Gents appear to be taking. Tour rules are laid down, and after the long flight, lack of observance to these is punished. The first round of fines is collected whilst still on route to the apartments - a standard was set! Wednesday morning, and upon arrival at the apartments, people head to their rooms to either unpack or grab their towels as quickly as possible in a race to get one of the few poolside sun-loungers that are available. Those who unpacked sensibly soon joined the sun seekers for a quick poolside recovery session, before our training afternoon at the Dubai Exiles Rugby Club. The training went well, with all three teams able to run through moves and play some opposed games of touch, whilst acclimatising to the heat and humidity. After heading back to the apartments, we went out for our first official tour meal. The Gents introduced us to some of their tour games, and the Ladies reciprocated. Portions were large, so was the bar bill. Much fun was had by all! Thursday saw a free day for us Ladies, unfortunately the Gents 7s team did not have this pleasure, with their first game scheduled at 08:40. So, after waking at a respectable hour, the Ladies team went their separate ways. Some left the apartments in search of shops and then the beach, while the rest stayed by the pool. A couple decided that enough relaxation had been enjoyed for one day, and went to support the boys in the rest of their matches. A good afternoon and evening of rugby followed, with both the Gents 7s and 10s teams putting in some spirited performances against some very strong opposition. Thursday evening saw the touring party divide with the Gents going off for a charity evening, and the Ladies for a carbo-loading session, Italian style, in preparation for their matches on Friday. Plans to regroup later after their respective meals came together and the touring party were back on track with the Gents showing the ladies some of their fancy footwork on the dance floor. The night ended back at the apartments with a lot of happy tourists present at the successful launch of Club 217. After a while and several renditions of the tour song, Running Bear, everyone dispersed and a good nights sleep was had. Friday afternoon saw us take to the pitch for our first match against Al-Khobar at 13:20. With a lot to prove to our team of supporters, captain Kate Sinfield won the toss and we took to the pitch with an air of confidence. This obviously paid off during the game with some massive hits from Cathy Smith, fantastic running from Trish Green and great decision making from scrum half Helen Buchanan. The vocal support from the Gents was fantastic, as was the number of water boys that we had for our match! Result: 34-0 to us. Scorers: 3 tries from Trish Green, 2 from Helen Buchanan, 1 try and 2 conversions from Kate Sinfield. Our second match was against the Hurricanes at 18:20, and after our earlier performance and winning the toss again, we were feeling confident. We chose to receive the ball from kick off, and quickly made our mark on the game with some strong running from Sophie Hocking and well executed side steps from Vicky Gallagher helping us to work our way deep into the opposition half. The Hurricanes regained possession and with the team putting in some hard tackles, had to resort to kicking ahead to get past our defence. The Hurricanes scored an unconverted try before half time, which meant that we would have to pull out all the stops in the second half. After one of the spectators offered her rugby services at half time, we took to the pitch with a fresh pair of legs and came back with a fine display of attacking rugby. With our strong defence preventing the opposition from scoring again, it wasnt long before a superb dummy from Helen Buchanan sent the defence the wrong way as she went over for a try. Unfortunately it was ruled that the ball hadnt been grounded and the try was disallowed. Nearing the end of the game and with another match to play later that evening, cries of Unleash the Petal were heard from our supporters. With the later game in mind, a substitution was made, and Kirsty Petal Sanderson took to the pitch for her first game of sevens. The final whistle blew not long later, and we left the pitch feeling downhearted that we had been denied a certain try which could have turned the game around. Result: 5-0 to them. Our final match of the day was at 20:00 against last years tournament winners, Doha. With tiredness setting in after the long day of rugby, the previous result going against us, and knowing that this was to be a tough match, it was decided that we play the game in true Harlequins spirit and show Dubai the champagne rugby that we had been practising for so long. We took to the pitch after winning the toss and gained possession straight away from the kick off. Doha regained possession after a mistake by Harlequins a short while later and were quick to capitalise on this, running in a try. We replied with some strong runs from the forwards, gaining ground all the time, and then a tight defence when Doha were in possession. Turning out to be quite an evenly matched game, play moved from end to end without another score before half time. We gained another pair of fresh legs from the spectators at half time and took to the pitch knowing that we could turn the game around. After a few minutes, an injury to Cathy Smith meant that she would have to leave the pitch to be replaced by Sophie Hocking. With ball in hand, Harlequins then set up an attack with Hocking, Monica Coyne and Gallagher driving the ball up the pitch. A ruck ensued, allowing Buchanan to take advantage of an overlap, sending Trish Green in for a try. Doha replied with a further two tries before the end of the game, which was indeed our hardest match in the tournament. Result: 17-5 to Doha. Scorer: Trish Green. After the rugby, Friday night saw the introduction of strawpedos to the uninitiated as the whole touring party went out for a meal followed by an evening of dancing in a local bar. This was a much needed chance to relax and bond as a tour group, and allowed us to reflect upon the previous days of rugby. 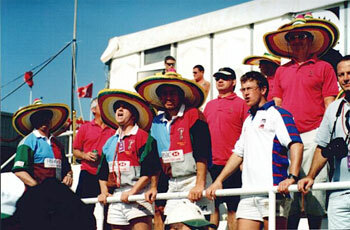 Saturday saw us arrive at the rugby ground kitted out in sombreros and our pink tour polo shirts to watch the international sevens. The atmosphere within the ground was fantastic  sun, sand and sevens, who could ask for more?! 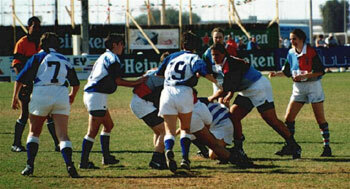 The rugby went on all day, with most of the finals being played in the afternoon. Some great displays of sevens were on show and were warmly received by the crowds, who by that point had been enjoying the Heineken tent all day. We left to continue the celebrations elsewhere, and as it was the final night of tour these went on for some time. Again, the Gents showed the Ladies what years of touring have done for them on the dance floor, Wayne Sleep would have been positively jealous! An eventful evening ensued, with top swapping, tequila body slammers, international links with Morocco, as well as half a yard of Smirnoff Ice. After that point and until Sunday morning, memories seem few and far between! Sunday morning dawned, and the end of tour drew near as we packed our bags and boarded the coach for the airport. After the previous night, we checked in slowly and then made our way to the restaurants and duty-free. The homeward flight was far less raucous than the Dubai bound one, with many of the group choosing to sleep rather than consume red wine or compete on the in-flight quiz. Upon arrival at Heathrow, the stewardess enthusiastically informed us that the temperature is 4 degrees. Thanks. Frostbitten already, we collected our bags and said our goodbyes. Realising just how much we would miss tour and everyone that was involved in it. 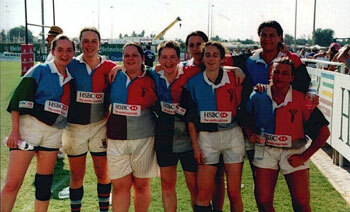 A big thank you must go to Mike Pudner for organising the trip to Dubai and extending the invite to the Ladies team. It was much appreciated by the whole touring party and we had a fantastic time. Thank you as well to the all of the Gents who gave the Ladies so much support throughout the competition and made our tour as enjoyable as it was.